Norbert's Power Folding Panel Mats, commonly referred to as Tumbling Mats, are filled with top layer of 1-3/8" crosslin­k polyethylene over 1" thick High Rebound 3470 polyurethane. This combination provides unparalleled lift and landings. 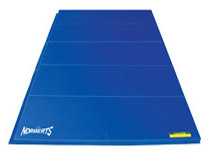 Mats have a firm working surface, perfect for tumbling on! Extremely durable 18 oz. vinyl covers are stitched with dacron thread. All these mats have 2" Hook and Loop fasteners on short sides for end-to-end attachment; Hook and Loop fasteners on four sides is recommended to create wider matted areas. 2' wide panels fold accordion-style for easy storage and transport.